I’m so thankful that my maternal Roberts family was fond of taking photographs, especially group photos on holidays. I was looking through digitized copies of my mom’s photos this morning and came across this one taken of the Roberts family on December 25, 1915, on the front steps of the Big House (Known locally as the J.T. Roberts house. Click on the photo for a larger view). Luckily, my mom wrote their names on the back. I would have been able to pick out a few of the people, like my grandmother Leona, most of her sisters, her brother Leland, and her parents, because I knew them (except for her parents, of course) when I was growing up. 4th row: 1-Edmund Pendleton (my cousin on my dad’s side) and wife 2-Stella (Roberts) Pendleton, 3-Kathleen (Roberts) Winn (for whom I named my daughter) and husband 4-Abial Winn, 5-Mary (Converse) Roberts and husband 6-John Young Roberts. 3rd row: 7-Maie Dell (Roberts) Covington, 8-Margaret Roberts (later Graham). 2nd row: 9-Henry L. Covington, Jr. (husband of Maie Dell Roberts), 10-Leona Roberts (later Redles, my grandmother), 11-Dinah Roberts (later Parramore, on my dad's side), 12-Edwina Roberts, 13-W. Leland Roberts. 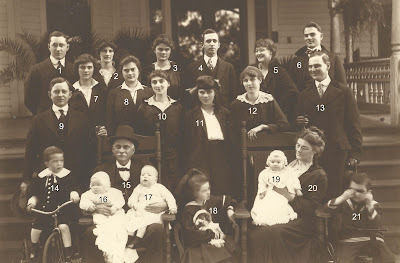 1st row: 14-Henry L. Covington III (son of Maie Dell Roberts and Henry Covington Jr.), 15-John Taylor Roberts holding babies 16-William Edmund Pendleton (son of Stella Roberts and Edmund Pendleton) and 17-John Roberts Covington (son of Maie Dell Roberts and Henry Covington Jr.), 18-Kathleen Winn (later Knight, daughter of Kathleen Roberts and Abial Winn), 19-baby Mary Young Roberts (later Oliver, daughter of John Young Roberts and Mary Converse), 20-Kate (Catherine Young) Roberts, and 21-John Winn (son of Kathleen Roberts and Abial Winn). Compare this photo to the ones I posted previously: The Roberts Family Circa 1900 and The J. T. Roberts Family—A Group Photo ca. 1936 and see how much this family grew. What a difference a few decades make!